Rebecca Jordan’s life is simple, disciplined, and uncomplicated, at least on the surface. Then she meets a handsome stranger/secret admirer named Michael Vale one fateful late night at a bookstore café. As a focused but struggling photographer with a passion for art, her outwardly happy world is turned upside down during this life-changing encounter when she quickly realizes she has met her soul mate. The undeniable attraction between them and their intense, immediate connection seem picture perfect as they discuss the shop’s local artwork, until Rebecca abruptly ends the chance meeting with no explanation. Betraying Brett, her loyal, loving boyfriend, is something Rebecca can never bring herself to do. Driven by a strong moral code and molded by divorced parents and a tumultuous childhood, she struggles to stay away from Michael, but fate and circumstance intervene, bringing them back together time and time again. As much as she resists, there is no denying her true feelings for him and the simple fact that Michael understands her in a way Brett never has. Michael proves to be everything she’s ever wanted, but remains just out of her reach. I kindly received Behind the Glass in exchange of an honest review by the author. Kristen Morgen sent me a review request not too long ago. At that time I closed myself from request. I also was going through a kind of reading crisis. I was away for a few days. Back at home I totally lost the drive for the book I was currently reading, I coudn't find back into it and also everything I started just felt not right. Behind the Glass was the perfect read to get my out of my crisis. While I was reading the blurb I felt this book could be a true gem, so I accepted Morgen's request. I'm very happy I made an exeption for this book because it was by far one of the most romantic books I've read this year. Now let me tell you what the story is about. Firstly I want to introduce Rebecca Jordan, the heroin in Behind the Glass. She is a very focused and disciplined person with having two jobs on the hand. By day she works as a staff photographer and by night she workes as a waitress at a local restaurant. She is, by her definition, a stuggeling artist paying her dues and is willing to make the needed sacrifices. Rebecca shares a huge passion for art and books. She loves to hide in the local bookstore café at late hours in the evening to enjoy a good book. One night Rebecca meets a handsome stranger called Michael Vale. They immediately feel a connection and quickly realise that they both found their soul mate. Rebecca is a real dilemma now. Will she stay with her loyal boyfriend Brett who she has been with the last seven months or will she listen to her heart and take the road to something unknown which can turn out to be best decision of her life? Kristen Morgen has written a wonderfully charming debut novel which I really loved. I sucked in every single word. I truly fell in love with the authors writing style. Her descriptions of the characters and places are so beautifully detailed. I was so connected to characters and the story and I was easily able to creat a little world in my head. You get so drawn into the characters world that you don’t want to stop reading. It doesn’t even feel like you’re reading after a while because everything seems so real and you feel emerged in this world where anything can happen. The more pages I turned I found out more and more pieces about Rebecca's and Michael's past. Rebecca simply wants to find her true love but is so scared of being left and hurt therefor what happend with her parents in the past. She's been always the good girl, never taking any risks, always been careful and making decisions with her head. Behind the Glass is alternating told out Rebecca's and Michael's point of view. Michael has been the perfect gentleman in the story. He is kind, honest, smart, funny, generous and always stays true to himself. He has never been a fan of 'one night' stands. When he meets someone, he considers a long-term future with that person. He simply wants more. That's what I really liked about him. The emotions the main characters shared were so powerful and believable, even so they were brillaintly formed. I loved how their relationship developed. Honestly, it was not very fast paced but sometimes you just don't want to read about people who jump into the bed together right after they first met. There are stories that you happily read that are enjoyable, even used as an escape but there are also those books that make you sit up and take notice and change the way you see the world. Behind the Glass had a clear message about friendship and love. The author did the perfect job of showcasing how relationships can change lives. If it truly is love at first sight, then in the end, it has to be a love worth fighting for. Some of you might claim it as very cheesy but sometimes you need to read such a cheesy read which makes you aw a lot and put a smile on your face. I have very few things to critizes. The first meeting of Rebecca and Michael happend much too quickly for my liking. It happend in the very few pages of the book. I wish the author would have had prolonged the meeting for a bit and had given the reader more of a introduction first. The other thing which is bothering me is the book cover. After reading the story I see the connection to the cover and respect the work the author has put into it. The thing is when I see the cover on it's own without reading the blurb, I label it as a crime/thriller/mystery novel and would never expect such a wonderful love story behind it. I think it gives the reader a wrong impression what the story could be. I'm just worried bloggers will deny to read the book because of the cover. It plays an important role if you deny or accept a request. We all say we don't judge a book by it's cover but secretly we all do. I wished for something more brighter, romance and chick-lit related. My message here: Don't judge a book by it's cover and more importanly give self-published authors a chance. Don't slag them off right away. They work very hard to spread the word about their book. To summarize, Behind the Glass is a stunning, beautiful and powerful tale of love and a feel good read for the heart. 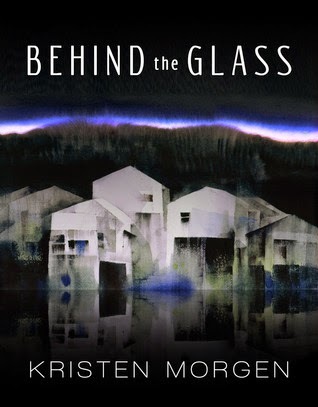 I really can't wait to read more of Kristen Morgen's work who is such a talented writer.